Conservator Karina Palmer fits AC/DC guitarist Angus Young's school uniform for Melbourne Museum's exhibition The Melbourne Story. AC/DC guitar god Angus Young would never make such a fuss perfecting his own tie but Melbourne Museum staff knotted it with latex-gloved hands. Proving that big stage presence can come in small packages, one of Young's schoolboy stage costumes will be displayed on a mannequin sized for a 10-year-old as part of an exhibition opening at the museum on March 20. 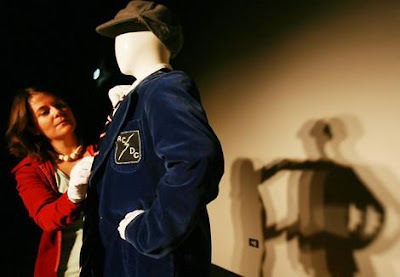 The school uniform, once worn tight on Young's 158-centimetre-tall frame, is one of 1200 objects making up the museum's most expansive exhibition to date, The Melbourne Story. AC/DC's guitarist Young formed the band with brother Malcolm in Sydney but the hard rockers' formative years were spent in St Kilda in the mid-1970s. One of Melbourne's lanes was renamed ACDC Lane in their honour in 2004. The Melbourne Story, with a $3.8 million budget and three years in the planning, is expected to last 10 years, with the occasional revamp. Lead curator Deborah Tout-Smith said deciding what to include or leave out of the mammoth display was painstaking. "We wanted to find new ways of showing things that people are already familiar with," she said. "We've got something on football but from when the sport was smaller, suburban and more tribal. There's fan paraphernalia like hand-knitted footy jumpers and scarves like mum used to make." Young's uniform will be teamed with replica socks and shoes. Ms Tout-Smith was more than happy to study AC/DC videos to correctly match Young's footwear. I like your tribute pages (if that's what you think of them as) ACDC rocks! Where Can i buy a angus young suite?